My first New Testament probably came from the Gideons -- if it wasn't the first, it's the first I remember. I must remember it wrong, though, because in my mind it's green, but according to the official color coding it should have been red or orange. Anyway, whatever its color, I was fascinated by the little book with its dry, crisp pages and cramped text, and the fact that it was small enough to put in a pocket. Over the years, that fascination has never worn off, which is why I have a stack of New Testaments on my desk right now. Let's take a look at what we've got here, starting at the top of the stack. 1. 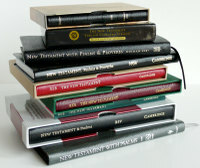 Cambridge Pocket New Testament (NIV), bound in black calfskin. I bought this one on a whim because of its tiny size. It measures 4.5 x 3.25, and 7/16 of an inch thick. The cover is flexible and aromatic, and the binding is sewn. In other words, quality-wise it's comparable to one of the larger Bibles. It even came in a miniature slipcase. 2. Crossway New Testament (ESV) with Psalms and Proverbs, bound in black genuine leather. Like the Cambridge NIV above, it measures just 4.5 x 3.25, but it's about 5/8 of an inch thick. That doesn't seem like much, but to the eye it looks almost twice as thick as the Cambridge. No matter, the ESV New Testament is excellent. Genuine leather is not the same as calfskin, of course, but the binding is sewn and, when it reaches the Psalms and Proverbs, the format switches to single column, which is very attractive in this form factor. 3. 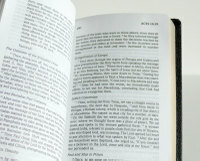 Holman CSB UltraTrim New Testament with Psalms and Proverbs, bound in black bonded leather. I don't know much about the Holman CSB as a translation, but this New Testament shows some good design sense. Just over 6.5 inches tall and 3.5 wide, it's about the size of a checkbook wallet. It's just half an inch thick, as well. The real news, though, is that the text setting is single column -- which is ideal for a tall, thin format. The picture at right illustrates the layout, which is clean and modern. (The only misstep, in my view, is the way the book titles are designed.) The binding is glued. 4. Cambridge New Testament (NRSV) with Psalms and Proverbs, bound in black imitation leather. The Cambridge site gives the measurements as 7.25 x 3.75, but mine measures 7 x 3.5. It's about half an inch thick, and the imitation leather cover is quite flexible. Combined with the sewn binding, it makes for a nice feel in the hand. Like the Holman CSB, this New Testament features a single column text setting (pictured at left). The type looks a little archaic to my eye, but otherwise this is a very attractive edition. 5-7. Cambridge Compact New Testament (REB), bound in (a) dark red calfskin, (b) burgundy calfskin, and (c) green softback. I bought the dark red REB New Testament sight unseen and was so impressed that I decided to get another -- one to use and the other to keep in reserve. Unfortunately, I was never able to find another of the reds -- booksellers kept sending me burgundy instead. No problem -- I've been giving them away. This is the most attractive single column text setting of Scripture I've encountered (although the Standard NRSV from Harper Collins rivals it in everything but form factor), so I don't mind keeping a few on hand to use as examples. I like the REB translation, too, and that helps. The red calfskin is luxuriantly flexible, but the burgundy tends to be stiff (sometimes extremely so). The leather editions measure 6 1/8 x 4.5, and they're 3/8 of an inch thick. The green softcover is just 5.5 x 4, since it doesn't have a leather cover to hang over. Both the leather and the softcover are sewn bindings. I'm worried, though, because the Cambridge site no longer lists the leather editions. They're still on the Baker site, though, and the color is listed as Dark Red rather than Burgundy. Also, there's an excellent, large photo of the page layout on the Baker page featuring the green "flexbind" cover. 8. Cambridge New Testament and Psalms (RSV) Pocket Edition, bound in black French morocco leather. This one I bought because it's a single column setting and the RSV is the source text of the ESV, which was the translation used at my church. Unfortunately, the setting isn't modern and is a little hard on the eyes, and the French morocco cover is quite stiff, in spite of the "soft and supple" description on the slipcase. The format measures 7 x 4.25, and it's about three quarters of an inch thick, making it the largest example in this listing. 9. Thomas Nelson New Testament with Psalms (NRSV), bound in gray bonded leather. This edition doesn't seem to be available any longer. Gray used to be a much more popular color for Bibles than it seems to be now, and I have several Thomas Nelsons in this exact binding, including an old KJV Open Bible. A bookstore had it marked for $1 on a discount table more than a decade ago, and I figured, "Why not?" The type is the same as the Open Bible, too, and I believe it's the precise typeface and layout used in the Thomas Nelson Bible I was given as a high school graduation present -- so there's continuity to the line. This one measures 7 x 4.5, and half an inch thick, so it's roughly equivalent to the REB NTs from Cambridge. The size makes it less portable than the super-small NTs earlier on the list, but it is naturally much easier to read. The great thing about a Pocket New Testament is that, even though it doesn't include the entire Bible, it is compact enough to have with you when a larger edition is sitting at home. All of these examples serve the purpose, some of them extremely well. Until I sat down to make this list, I didn't realize how many of them had sewn bindings -- quite a surprise. Years ago, a man came to speak at our church and he withdrew from his pocket a battered orange Gideons New Testament, which had been given to him decades before by the same man who'd shared the Gospel with him for the first time. I was impressed he'd kept it with him all those years, and though I can't say that I'm always similarly equipped, remembering his story makes me resolve again to try.